Between Marathon (Long Key) and Duck Key lies the impressive Seven Mile Bridge. The bridge crosses seven miles of open water that separates Florida Bay from the Atlantic Ocean. The original bridge was built in the early part of the 20th century by Henry Flagler. Most of that 100 year old bridge still stands. After the railroad was destroyed by a 1935 hurricane, the state of Florida bought the right of way and converted it to an "overseas highway". The original railroad and highway has been replaced by a modern overseas roadway. 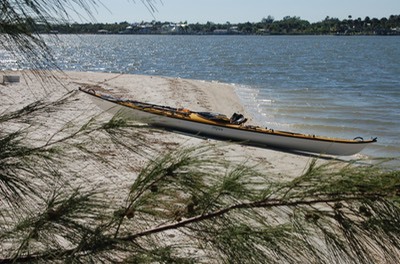 For paddlers, this seven mile span provides the longest stretch of open water to traverse while paddling along the keys from Key largo to Key West. On this crossing the weather was unusually benign. The seas were flat with only the slightest wind. 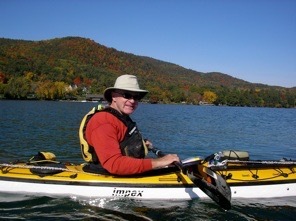 Typically, a 15 mph wind is blowing as it was on my first crossing of this area in 2012. This video details the 2013 crossing. The Florida East Coast Railway (reporting mark FEC) is a Class II railroad operating in the U.S. state of Florida; in the past, it has been a Class I railroad. Built primarily in the last quarter of the 19th century and the first decade of the 20th century, the FEC was a project of Standard Oil principal Henry Morrison Flagler. Flagler originally visited Florida to aid with the health issues faced by his first wife, Mary. 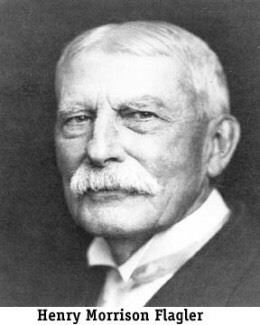 A key strategist who worked closely with John D. Rockefeller building the Standard Oil Trust, Henry Flagler noted both a lack of services and great potential during his stay at St Augustine. He subsequently began what amounted to his second career developing resorts, industries, and communities all along Florida's shores abutting the Atlantic Ocean. The FEC is possibly best known for building the railroad to Key West, completed in 1912. When the FEC's line from the mainland to Key West was heavily damaged by the Labor Day Hurricane of 1935, the State of Florida purchased the remaining right-of-way and bridges south of Dade County, and they were rebuilt into road bridges for vehicle traffic and became known as the Overseas Highway. However, a greater and lasting Flagler legacy was the developments along Florida's eastern coast. During the Great Depression, control was purchased by heirs of the du Pont family. After 30 years of fragile financial condition, the FEC, under leadership of a new president, Ed Ball, took on the labor unions. Ball claimed the company could not afford the same costs as larger Class 1 railroads and needed to invest saved funds in its infrastructure, fast becoming a safety issue. Using replacement workers, the company and some of its employees engaged in one of the longest and more violent labor conflicts of the 20th century from 1963 until 1977. Ultimately, federal authorities had to intervene to stop the violence. However, the courts ruled in the FEC's favor with regards to the right to employ replacement workers. During this time, Ball invested heavily in numerous steps to improve its physical plant, installed various forms of automation, and managed to end all of its passenger services, which were unprofitable.